Luxor's bestselling multipurpose utility cart will securely store and transport your valuable electronic equipment from room to room. The steel construction and robotically welded shelves ensure long lasting durability in tough environments; additionally, the adjustable height features cater to any user with its top shelf ranging from 24" to 42". The spacious cabinet protects sensitive and costly equipment with reinforced locking doors, while textured mats and retaining lips keep the shelves' contents securely in place. 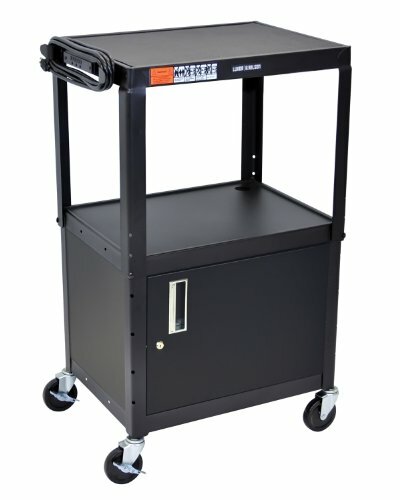 Allow this multimedia cart to safeguard your equipment and simplify storage. Ideal for schools, conference centers, businesses, and trade shows. 20-gauge steel cabinet features a reinforced locking door with full length piano hinge. Height adjustable in 2" increments between 24" - 42". Grommet holes accommodate cables and wires. Easy transportation with 4" silent-roll, full swivel ball bearing casters, two with locking brakes. 3-outlet power strip with 15' cord provides power to onboard devices. Holds up to 300 lbs. (evenly distributed). Includes safety mats. Assembly required. Made in the USA. Color: Black.